As the Avengers Infinity War film approaches the Avengers are on a much teased collision course with Thanos. 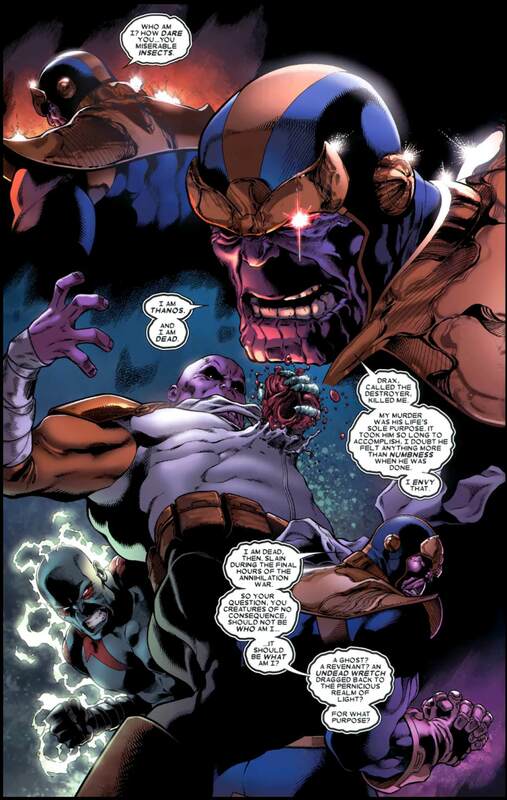 Many will ask the question how is Thanos killed or defeated in the comics. Here is a collection of notable times he has been killed or soundly defeated. This post will layout who kills Thanos on each occasion. Thanos is very much designed to be one of the biggest baddest bad guys in the Marvel Universe who is capable of going toe to toe with a multitude heroes at once. Even without the Infinity Stones he is one of the most intelligent, ruthless, skillful and strongest fighers in the Universe. To make him even tougher Thanos is often using the powerful Infinity Gauntlet giving him God like powers when they are all assembled. What might surprise people is that Thanos has actually died numerous times and is killed by multiple heroes. 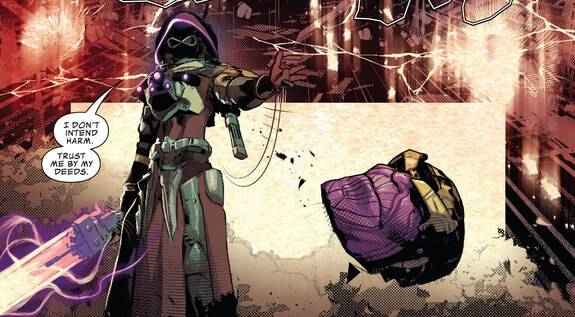 Warlock who in the early years of the character served as the heroic nemesis of Thanos once told Thanos that the Mad Titan loses on purpose because deep down Thanos knowns he is unworthy of the powers he is accumalting. Thanos has another weakness in that he creates many powerful enemies. Not only does Thanos tick off all of Earth, but he also angers many cosmic entities including the Watchers, Galactus, Mentor of Titan, The Elders of the Universe and other mysterious entities like the Beyonder and Eternity. The final weakness of Thanos is that his infatuation of death may lead him to wanting to die to be with Mistress Death. This really is his ultimate weakness in Thanos's heart he wants to die and be with death. This is his goal. Yes this goal makes him unquelchingly evil and mad as well, that is what makes Thanos so utterly terrifying. What lengths will he go to in order to impress death? There seem to be no limits. The characters that have killed Thanos include Warlock, Drax the Destroyer, Thane, and Doctor Doom. Thanos is also one of the ultra powerful characters who were defeated by Squirrel Girl. Ironically, despite Thanos's desire to die and be with death he is continually resurrected and denied his wish. The first death of Thanos occures in the cosmic cube story that introduces the idea of powerful artifacts that could give a villain like Thanos god like, universe shattering power. Thanos kills the powerful Warlock in this story but Warlock's soul goes into his soul gem. Spider-Man and the Thing manage to inadvertently free Warlock's soul who returns even more powerful than before. Thanos is turned to stone and shatters dying. 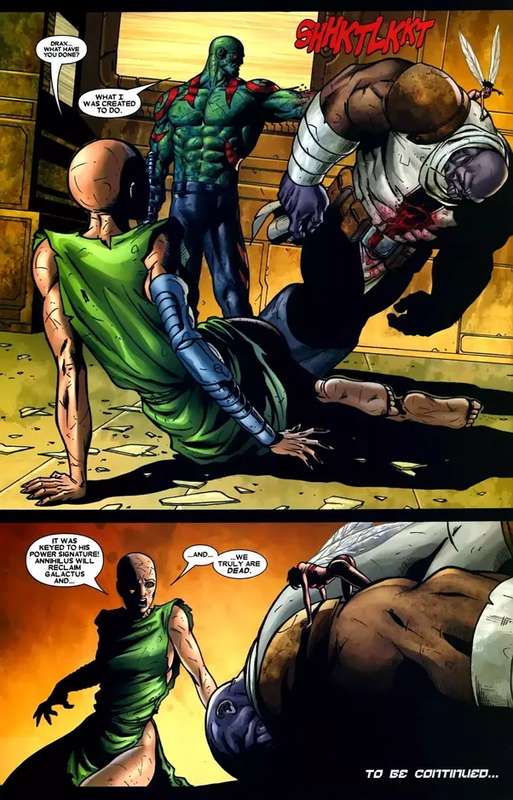 Thanos is next seen with the fallen hero Mar Vell whom he welcomes into death. The two walk together into the beyond. In Infinity Saga Thanos is brought back to life by Death herself. Death is perturbed that there are more living things in existence now then there are dead things from all time. In an effort to rebalance the universe Thanos is revived with the aim of eliminating enough living beings so that the dead will outweigh the living. In this story Thanos gains God like powers and wipes out half of all life in the universe. However mistress death still gives him the cold shoulder. Eventually, Thanos is told by Warlock that he allows himself to be defeated because he knows that he is unworthy of the power he has accumulated. He lowers himself and is eventually killed. Effectively in this story Thanos defeats himself. Though he does not die here. In the the story of Annilalation Thanos is involved with a few other big bad guys named Annilus and Galactus. Thanos wants to oppose Annihilus but before his plan can work he is killed by Drax the Destroyer. Drax whose family had been killed by Thanos had been hunting Thanos ever since his creation. It was not until this moment that he succeeded in actually killing the Mad Titan. Unfortunately, for Drax the death of Thanos could not have been at a worse time and the heroes must then figure out how to defeat Annihilus without him. As Nova is near death while battling Annihilus he has a vision of seeing Thanos standing next to Mistress Death. This vision is similar to the one scene where Thanos welcomes Mar Vell into death after his first demise. Thanos is not left dead for long. The universe is threatened by a different universe where life has conquered death called the Cancerverse. This cancerverse begins spilling into main universe consuming it like an unstoppable parasite. Seeing the need to stop life, heroes resurrect Thanos as the ultimate agent of death to defeat the Cancerverse. Thanos helps defeat the Cancerverse and survives for a time in various forms of imprisonment. 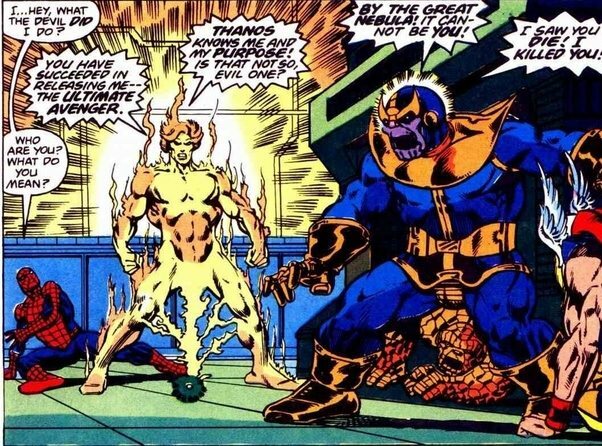 A freed Thanos begins to seek out his son Thane to kill him. However, Thane gets the better of his father and imprisons him in a form of stasis or living death. Namor frees Thanos from his state of undeath and adds him to the Cabal. The Cabal is a group that lands on other Earths (Different Universes) and destroy them so the two Earth's can avoid a universe ending collision. Eventaully, this gives rise to final collision, which ends in the Marvel event Secret Wars where Doctor Doom acquires god like power. Thanos survives the final collision of Earths and lands on Battleworld many years after it was first created. He immediatly creates a rebellion against Doom not fully understsanding the latters immense power. Emperor Doom then kills Thanos. Thanos is returned to life accidentally through the actions of Galactus. He forms an alliance with Hela in an attempt to gain control of the Ultimate Universes Mjornir. Curiousily Warlock, Doctor Doom and Thane do not exist yet in the MCU. This means that it will likely be up to Drax or tricking Thanos to defeat himself. Not a good situation for the heroes to be in during the Avengers Infinity War film. 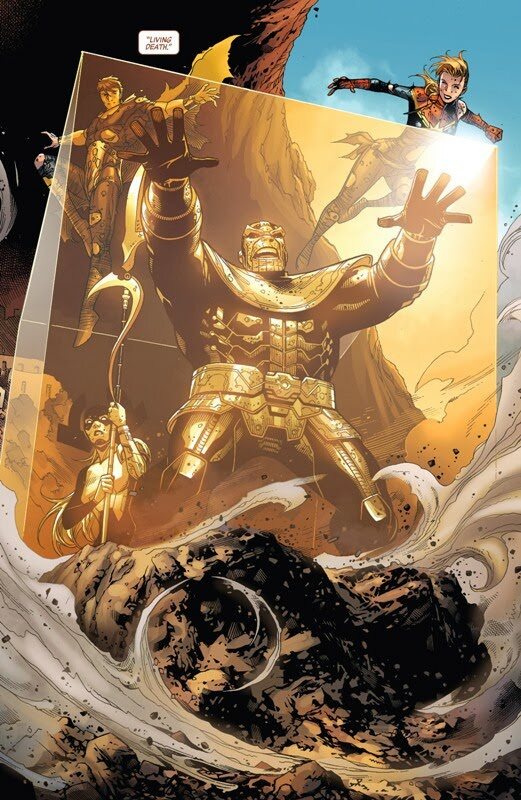 Thanos is decapitated by Requiem whose sword is embedded with the Power Infinity Stone. Requiem's identity is revealed in Infinity Wars #1.